After last week’s 60 Minutes feature on Alice Waters and the Slow Food movement, I danced a little jig. Sure I was a bit annoyed at some aspects of the coverage, but it was coverage. Guess who appeared on the cover the The New York Times Sunday Business section yesterday? Of course, it’s Alice Waters. And this time, I actually really liked the reporting going on. Andrew Martin quoted several of the movers and shakers in the Real Food Revolution. The gist of the article is this: Real Food is going mainstream. Whether it’s the throngs of Washington congressmen now carrying around copies of The Omnivore’s Dilemma (a Food Renegade Must Read), or last week’s announcement by Michelle Obama that she’s planting a victory garden on the White House lawn (the first in more than 60 years! ), Washington is abuzz with the idea of creating a more sustainable, diversified, regional food system. While that sounds fantastic, I’m not sure there will actually be much legislative progress in that direction in the near future. The most influential bill on the American food system (The Farm Bill) just passed last year, and it’s generally only revisited once every 5 years. That’s just not true. A recent, wide scale survey of food production levels in both developed and developing countries found that ecologically sound agriculture could not only successfully feed the world, but could arguably feed an even larger population without increasing the land dedicated to farm use. Not surprisingly, the study showed that in developed countries, ecological practices generated a slightly smaller yield than conventional methods (92% as much). But in developing countries, they generated an astonishing 80% MORE food. And contrary to popular opinion, leguminous cover crops really can fix enough nitrogen in the soil to eliminate the need for synthetic fertilizers. I think it’s this sort of information that people crave right now. They need to hear the truth about sustainable agricultural practices, and they need to hear the truth about the real cost of food grown in the industrialized agricultural system. We’ve already come so far in this movement. People everywhere are starting to wake up and ask questions about where their food comes from, how safe it is, or how ethically it was grown. But when people see the costs of “organic” foods at their grocery store (if it’s even available at their local supermarket), they take a step back. We’re used to eating cheap food. So, go read the article and tell me what you think. What always surprises me about statements like the one from the National Corn Growers Association is how completely outlandish they are. How, then, did our grandparents, great-grandparents, etc. manage to survive without chemical poisons to help “grow” their food. I realize that these statements are marketing and nothing else, so maybe what I’m really surprised at is how people don’t think for themselves, they swallow this disinformation hook, line, and sinker. There is an excellent book (I’ve looked through it, but haven’t read it yet) called Farmers of Forty Centuries by F.H. King published in 1911. Mr. King visited Japan, China, and Korea to see how they had managed to how they continued to feed large populations from smaller growing areas. They did NOT use modern chemicals. Land that has been cultivated for 40 centuries is still incredibly lush and productive at the time of his visit. I think this book is an important supplement to Dr. Price, who did not get to these areas of the world. Janet — Thanks for the book recommendation. I’ll check it out. As to why people fall for the disinformation, I think it’s because in some sense it’s not too far from the truth. Michael Pollan wrote about it a bit in The Omnivore’s Dilemma. He correlated the dramatic recent upswing in human population with the advent of radically increased yields from chemical fertilizers. I’ve loaned out the book to a friend, so I don’t have the statistic in front of me. But he pretty convincingly argued that without chemical fertilizers, we’d probably have about 20% less people on the planet right now. Pollan wasn’t saying this makes chemical fertilizers good, or even that more ecologically sound agricultural practices couldn’t sustain all of us. But what he did point out is what most of us know: the reason chemical fertilizers caught on was because of huge yield increases. This makes people assume that without these fertilizers, yields would be too low to produce enough food to feed all of us. Yet that’s just not true. It’s not as if people in the U.S. were practicing “sustainable” agriculture BEFORE the advent of synthetic fertilizers. It was still industrialized agriculture, just a less productive version of it. That’s why I’m thankful for this recent study which actually compares REAL ecologically sustainable farming with conventional/industrialized farming. I love this post and your positive attitude. Sure we can produce more food, but funny how our nation continues to be less nourished with this greater amount food. It is about quality, not quantity! I feel we have a long way to go, but like you I am so excited that these topics are gaining more and more attention. I think once people realize that they can afford it and we can support old school, local farm practices we’ll be headed for big changes. I’m headed over to read the article now. Lori — Let me know what you think of the article. Really, it covered so many different bits of this and that within the Real Food Revolution that I was impressed. Great post. I just watched the movie “King Corn” and was struck by the same line of reasoning from the corn industry – the idea that if they didn’t produce more corn feed meat, Americans would starve. “That organic stuff might be okay for you rich folks,” they suggest. Ugh! 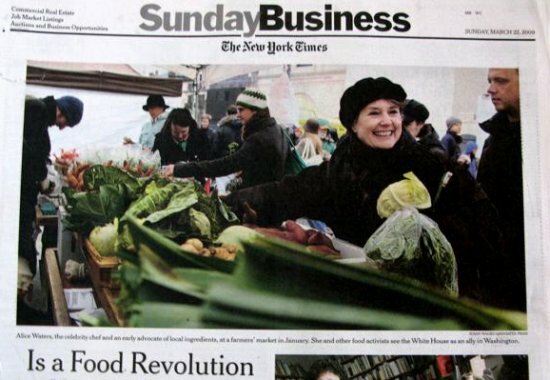 It’s fantastic to see more of Alice Waters and Michael Pollan in our daily lives! I’m really enjoying your blog. Great work. Michelle — That’s a good question. I’m really not sure how to answer. Just look at how much has changed in our lifetimes thus far. I predict we’re on the upswing. Lee — Thanks! I just read an article today talking about how we could turn over 50% of the corn and soy fields in the U.S. to permacultured grasslands and raise THE EXACT SAME AMOUNT of cattle we now raise in CAFOs on that grass. Not only would it be cheaper, it’d produce significantly healthier meat AND be more environmentally sustainable. I think its great going mainstream, yet I feel there will be compromise in what real food really is. Most of the time there is always compromise when something goes ‘mainstream’. This is my first time posting, so let me introduce myself. I’m Phil and I am a chef. I work at a Bible institute in upstate New York. I went to a community college in Canada and studied culinary arts. It was there that I learned to love real food. Unfortunately, work requires being under budget, labor is low, and food distributors do not deliver local stuff. On top of that the health department has certain requirements for institutions. Thus the challenges of trying to go local. Thanks for all the info I have received from this blog and others like it. I have bought ‘Nourishing Traditions’ and will be slowly implementing that into my own life and little by little into my job. I hope that the people growing, buying and eating the real food will stay strong/cohesive enough to keep the movement as their own if and when it all goes mainstream. I know that sounds selfish but mainstream seems to mess things up in the name of politics and money. Phil & KAthy — I know you’re both right. The silver lining seems to be that part of the Real Food Revolution is diversified, more local food distribution networks. So long as we keep “voting with our forks” and building up those more local economies, we’ll have a lot more accountability built into our system. Awesome coverage! It is a food revolution. It’s wild that what you put into your mouth has become such a political statement. I’m so thankful that people are reconnecting with traditional food and learning to value small vs. large and local vs. corporate. Three cheers for fighting the good fight! Yes, KingCorn is a need to watch documentary. Corn is never going anywhere . . . what politician is going to lead the charge starting in Iowa – home of the very first primary ever politcal season. None with any future ambition and I’m afraid not may of them exist. Ron Paul, maybe? But even if they stopped it with corn – biotech would come up with something else we need to subsidize and that THAT ingredient would become prevalent in almost everything we consume. The real problem is of one of education: most people I’ve spoken to on this have no idea about GMO, the types of amounts of crap used on crops,etc. Their general feeling: if all of these were so bed, we would know, doctors would no, there would be reports on Television about it. Yeah, we’d know just like we knew about Wall Street playing Russian Roulette with our money, just like we knew in the 40s that smoking was bad for us, just like we knew Enron was a great company to be invested it. Most often folks, we don’t know until it is too late and for many people that comes with they themselves get ill and can’t take it anymore.